I mentioned before that we had some passive solar heating in the greenhouse. Here is a picture of the high-tech system we've got. Ta-dah! Metal drums filled with water. The sunlight hits these drums during the day warming the water which then radiates heat out at night. It is difficult to tell what gain we get from these, but it must be better than nothing. Unfortunately, with our hopes of winter gardening in such a cold climate we'll be needing some additional heating features and insulation. Right now, we have some experimental bubble wrap placed over top of some beds. That really seems to help and we might end up using some bubble wrapped hoop houses within the greenhouse. We'd rather not actively heat the greenhouse if at all possible. Below you will see our current pride and joy - the radishes! We planted these about 2 weeks ago directly into the beds. They are just starting to get true leaves, but look very healthy. When we had a cold snap down to 1 degree Fahrenheit last week we lost a couple, but some were completely frozen and still pulled through. 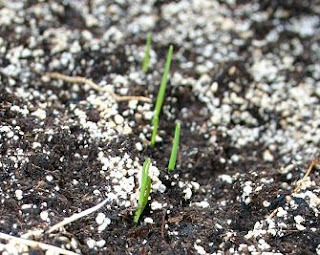 Below are some onions that we direct sowed about 2 weeks ago. Grow onions, grow! 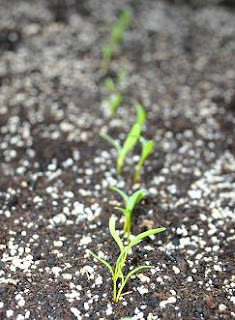 These are burpee's golden beets that we direct sowed 2 weeks ago. Lastly, here is the arugula. We started these indoors about 2-3 weeks ago. I panicked about winter coming last week and we transplanted these way early against all of the sound gardening advice out there. However, we got lucky and most survived. So that is what's going on right now! I wish we'd been able to move in to the house a few weeks earlier to get a better jump-start on winter. We've had snow 4 times already! It is crazy cold weather, even for Montana. Next year I'll be starting the winter veggie crop at least 3 weeks earlier. 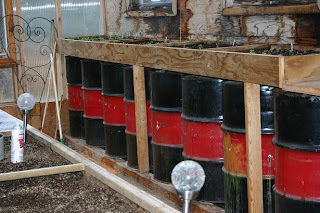 I love your greenhouse setup and look forward to hearing more about how your little seedlings fare. 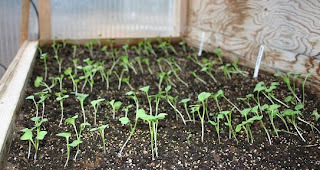 We started a bunch of spinach, arugula, and turnip greens in our cold frames around the same time. 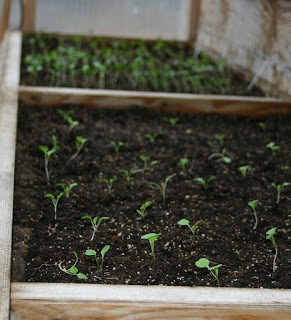 We do this so that they will establish a decent root system and then after going pretty much dormant in the winter most will take off in the early spring way before anything can be planted in the soil...the spinach and turnips love the early spring weather.